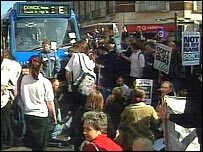 Pupils' behaviour was "totally unacceptable"
A number of students have been expelled from a south Devon college because of their actions during an anti-war demonstration. The group from Torquay Community College are accused of spitting at police, verbally abusing staff and refusing to move from a zebra crossing. Students at two other schools in the region are facing suspension after they skipped lessons to attend anti-war protests on Wednesday. The region saw more anti-war protests on Thursday by students and others. Protests were held at a number of South West towns, including Truro, Tavistock and Ivybridge. The Ivybridge protest saw about 200 pupils from Ivybridge Community College marching through the town centre. Another protest, which also involved many school pupils, brought Exeter city centre to a standstill. Eight people, not believed to be students, were then later arrested after chaining themselves together at Exbridges in Exeter. They blocked a road in the area. Police said they endangered someone's life as they obstructed an ambulance. They were arrested for obstruction of the highway. A spokeswoman for Torquay Community College said the pupils' behaviour was "totally unacceptable" on Wednesday. She stressed they were not expelled for taking part in the protest, but because of their actions during it. The spokeswoman said: "Unfortunately after a peaceful protest, the behaviour of a few pupils became extreme and this involved verbal abuse to staff, and health and safety risks to staff, pupils and the public." Pupils were being interviewed on Thursday with each case decided on individually. Pupils from Humphry Davy School in Penzance also face suspension after joining Penwith Sixth Form College students in a protest through Penzance town centre on Wednesday. Roderick James, head teacher at Humphry Davy, said he would decide in the next few days what course of action to take. Twenty pupils at Cape Cornwall School in St Just, near Penzance, were suspended after joining the march. At least 100 students at St Boniface School in Plymouth face being suspended after a protest on the Hoe and in the city centre also on Wednesday. Tom Healey, public relations spokesman at St Boniface, said: "What will happen to particular pupils is largely to the judgement of the headmaster. "We realise that some pupils have strongly held views about the present political situation. We have no problem whatsoever with them giving vent to those feelings. "However, we have got a duty of care towards pupils, and those who play truant." Students at Devonport High School for Girls in Plymouth led an anti-war demonstration on the school playing field at lunchtime on Wednesday after being forbidden to leave lessons. The school said there was an opportunity to voice opinions in citizenship classes. In another Wednesday protest, students from colleges and schools in Exeter marched through the High Street and into Rougemont Gardens. Pupils from Priory High School in Exeter were allowed to leave lessons if they had written permission from a parent. 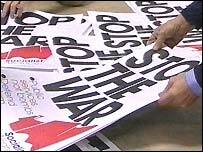 Protests organiser Pete Heddle of the Stop the War Coalition said: "Students have the right to protest and you can't suspend students for walking out of school to demonstrate against war. "It's a shame not many of them had the confidence to do that, but I hope that as the war progresses, students will feel more confident about coming out and protesting."